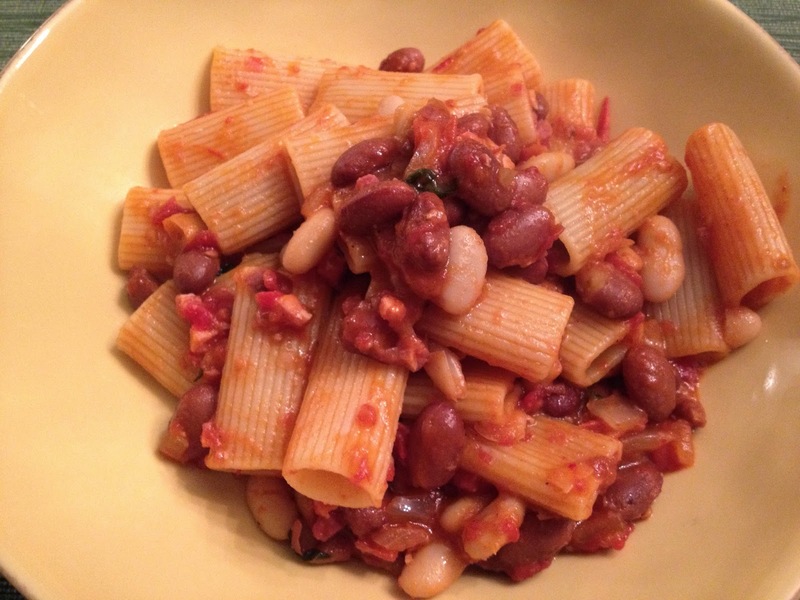 Pasta e Fagioli; an authentic Tuscan classic and about as simple to make as a recipe can be. Pasta & Beans is a staple throughout Italy, but at a tiny Trattoria in Panzano, I had a great version that was enhanced with a little cubed pancetta and kissed with some heat from pepperoncini. It was an amazing combination of flavors and textures. I’ve replicated it fairly well in today’s recipe. This dish can go from stovetop to table in as little as 30 minutes, so it’s imperative to use the best canned tomatoes you can find. If you want to use fresh tomatoes, make sure they are perfectly ripe. Start by sauteing the garlic in some extra virgin olive oil. Once fragrant, add the pancetta and allow the meat to render some of its fat and obtain some texture. While that is working, pour the tomatoes into a large bowl and crush them gently with your bare hands. You want to crush them well, but it’s ok if there are odd size pieces because it adds to the rusticity of the dish. Once done, pour the tomatoes into the pan. Allow the tomatoes to simmer for 10-15 minutes over medium heat. While that is happening, rinse the beans in a colander and drain well. After the tomatoes have been cooking for 15 minutes or so, add the beans, stir to combine and season with salt and pepper. Add the crushed red pepper, lower the flame to low, and allow to simmer another 10 minutes. Toss with your cooked pasta, add the basil and serve immediately. It’s that easy and the best part – you can pair this with almost any red wine. 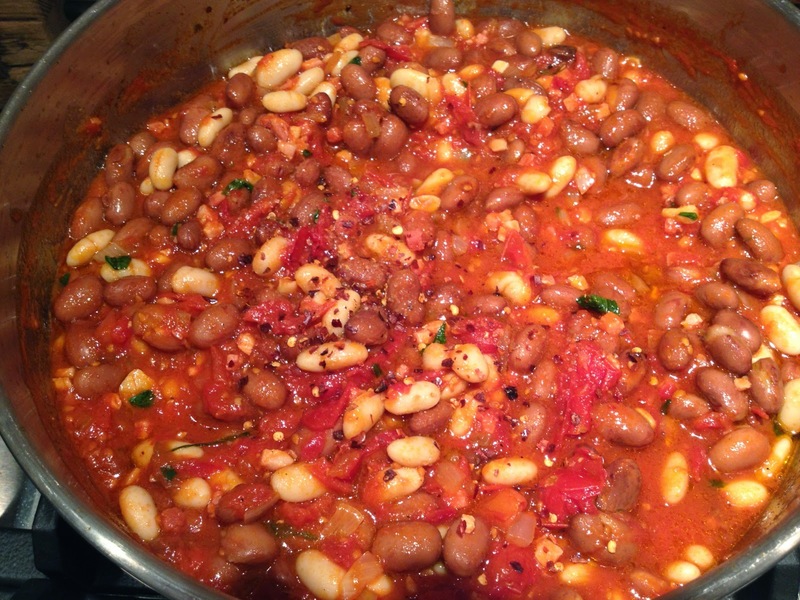 We tried this with Chianti Classico, Brunello, Barolo and Barbera and all worked well with the meaty aspect of the beans, the acidity from the tomato and the smokiness from the pancetta. John, first, thank you for the great articles (like always) you have put in the last two weeks. Your appreciations for Galatrona and in general Banfi's were very insightfull. I totally agree for Antinori CCRs.. The estate's CCR is good in every vintage… a good price-value wine that can be drink either young or with a few years of age.. I always find that this wine is a good "indicator" of a vintage in tuscany.. As for Badia a passignano, I was a little cold buying the 2008 but based on your tasting I will definitely purchase it! I think starting from 2010 this one is being part of the "gran selezione" label. Looking at your rigatoni, you did use onions for the dish right? I suspect you're right. 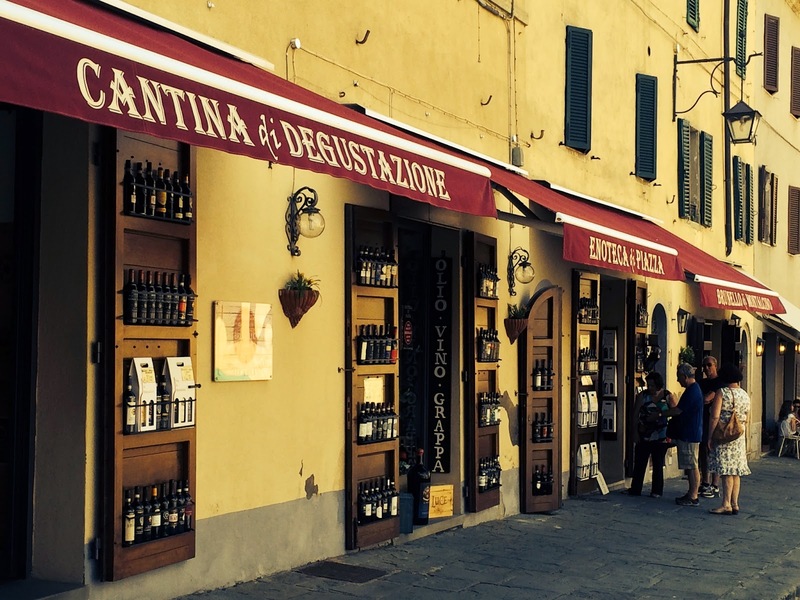 From 2010 I'll bet the Passignano will be a Gran Selezione. Try the 2008. I'm not sure I'd age it too long, but it's very nice now and it surely has the acidity to stay fresh in the cellar for at least a few years. Thanks for the comments in general. I appreciate the feedback and support. And you know, on the Rigatoni, I probably did use some onion. I almost always do, but I couldn't remember this time, so I didn't mention it. It certainly wouldn't hurt!